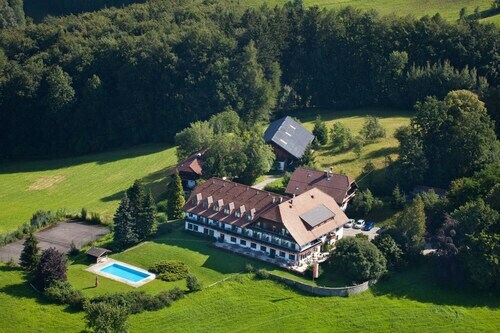 Situated in a rural location, this hotel is 2.7 mi (4.4 km) from Gustav Klimt Park and 2.8 mi (4.5 km) from Attersee. Freibadeanlage Litzlberg Park and Weyregg am Attersee Golf Club are also within 12 mi (20 km). Located in Salzburg-Umgebung District, this luxury hotel is within 6 mi (10 km) of Odeion Kulturforum Theater, Mirabell Palace and Gardens, and Fortress Hohensalzburg. Maria Plain Wallfahrtskirche Basilica and Salzburgarena are also within 6 mi (10 km). 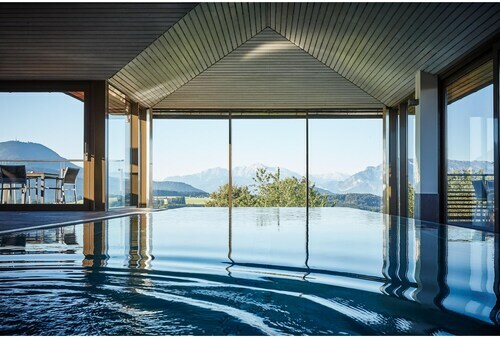 Located in Salzburg-Umgebung District, this spa hotel is 1.8 mi (3 km) from Fuschlsee and within 12 mi (20 km) of Salzburgring and Fortress Hohensalzburg. Mozart's Birthplace and Hellbrunn Palace are also within 20 mi (32 km). Located in Gnigl, this hotel is 0.9 mi (1.5 km) from Neuhaus Castle and within 3 mi (5 km) of Mirabell Palace and Gardens and Salzburg Cathedral. Fortress Hohensalzburg is 2.7 mi (4.4 km) away. Salzburg Gnigl Station is 26 minutes by foot. How Much is a Hotel Room in Sankt Georgen im Attergau? Hotels in Sankt Georgen im Attergau start at $87 per night. Prices and availability subject to change. Additional terms may apply. Are you intending on vacationing in Hausruckviertel and looking to choose hotels in Sankt Georgen im Attergau? With 4 accommodation options on Travelocity within a 6-mile (10-kilometer) sweep of the city center, it shouldn't be hard finding somewhere appropriate. Sankt Georgen im Attergau will become a home away from home thanks to a variety of central Travelocity-listed rooms, like the Attergauhof and Hotel Retro. The Schloss Fuschl, a Luxury Collection Resort & Spa can be found 14 miles (22 kilometers) from the main part of Sankt Georgen im Attergau. Also, the Im Weissen Roessl can be found approximately 13 miles (22 kilometers) away. Or, you could investigate the Cortisen am See or the Ebner's Waldhof am See. After you have got to know Sankt Georgen im Attergau, put aside some time to visit the many natural and cultural attractions of the Upper Austria area. Upper Austria is marked by forests, rivers, streams and lakes. Popular holiday draws are castles. In this fascinating part of Austria travelers can also take up the chance to partake in snowboarding and skiing. 8 miles (13 kilometers) away from Sankt Georgen im Attergau, you'll reach Mondsee, home to Church of St. Michael and Market Square. 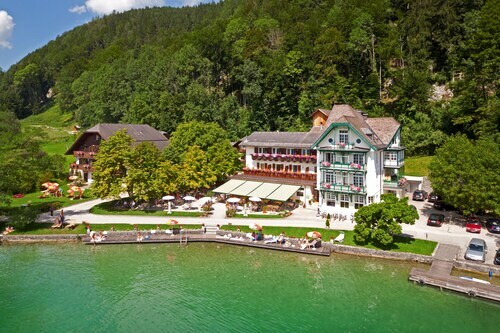 If you visit Mondsee, check out the Iris Porsche Hotel & Restaurant and Gästehaus Stabauer. 30 miles (48 kilometers) to the northeast of Sankt Georgen im Attergau, you'll reach Wels, which is home to the Best Western Amedia Wels and Hotel Ploberger. If you're staying in Wels, set aside a little time to check out the Stadtplatz and Salome Alt House. Consider spending a few hours enjoying the thrills and spills with local sports obsessives at an engaging match. TipsArena is located 45 miles (71 kilometers) to the northeast of Sankt Georgen im Attergau. Find accommodation right in the thick of the sporting action at the Art & Style SPITZ Hotel or the Austria Classic Hotel Wolfinger. When you're flying via W.A. Mozart Airport and want to book a room in the area, have a look at Laschenskyhof or Sheraton Grand Salzburg. From a personalized, cheery welcome by the front desk staff, to the Lederhosen clad waitstaff, the excellent food and hotel decore, I see this hotel to be one of the best in the Austrian Salzkammergut in terms of comfort and ambiance. If there is one thing that was missing in our room, it was a fan or AC unit as it was a warm day - the proximity to the water cooled the air soon after sunset. Definitely a place to go back to. Rent A Wreck Rent a Car at 2955 THIRD ST.